What was supposed to be a nice outing, in a warm place, far away from the bitter clutches of the Minnesota winter, turned out to be a struggle against the elements for 8 students on spring break from Macalester College in St. Paul. Noah Stieglitz, a member of Macalester’s Outing Club, and also one of the leaders of the expedition, told me on a phone interview, that he’d chosen this section of the A.T. because it was on their list of suggested hiking destinations. Noah, a native of Atlanta, having grown up hiking in the Southern Appalachians, thought it would be a great place to go for spring break. Excited to be getting a week away from Macalester, a liberal arts college, the 5 men and 3 women, all around 20 years old, drove the school van over 1000 miles, arriving in Hot Springs on Sunday, March 12th. Most of them didn’t know each other, they just wanted to go on a hiking trip. Soon though, they were going to get to know each other in ways only people in survival situations can. The next morning, they parked their van in the A.T. parking lot, which happens to be adjacent to Laughing Heart Hostel, and began assembling their hiking gear. Some in their hiking party went into the hostel, asking to fill their water bottles, which Jeff Hines, the hostel manager, graciously permitted. Once their gear, most of which had been rented from the school’s Outing Club, was loaded, they all set off south on the A.T. They had been aware that the weather forecast was calling for a rain/snow mix, accompanied by high winds and plunging temperatures, but they forged on anyway. Hiking up the long, steep grade, the tiny town of Hot Springs shrunk further and further below, as they ascended out of the quaint little valley. After a mile or so, the trail levelled a bit and followed a ridgeline for another few miles of gentle uphill grades, passing through the wonderful ‘green tunnels’ of rhododendrons that keep their long, waxy green leaves year ’round. At 3.2 miles of steady effort, they arrived at Deer Park shelter, a tiny log cabin beside a little stream, and began to set up their two, 4-person tents. To their dismay, they discovered that not only did they forget to bring ground tarps, but their used tents had not been waterproofed for some time. Wouldn’t you know it that during the night, the temperatures did plunge, and the wind whipped up a rain/snow mix. By morning, a wet snow began to fall. And some of their gear did, in fact, get wet. Noah told me that mornings on the trail were when their spirits were the lowest, and this morning they all were feeling the effects of the dismal cold and wet weather. After cooking a hot meal, the group ‘saddled up’ and moved on. The snow continued falling all day as they hiked the long, 9.9 mile uphill climb to Walnut Mountain shelter. Noah told me that, once they all got moving, their spirits lifted and they began to enjoy the hike and the magnificent beauty of the Appalachian winter-wonderland; every branch covered with snow. Noah explained how none of the students had any physical preparation for the long, uphill grades as the area around St. Paul is mostly flat. So, this section of trail, which according to the A.T. distance calculator (www.atdist.com) listed 3690 feet of elevation gain and 1760 loss–more uphill than down–made for some very sore and very tired hikers. Tired, cold and sore, they arrived at the tiny log cabin shelter at Walnut Mountain, where there was about 5 inches of snow on the ground. Since the only dry patch of ground where they could set up their tents was beneath the shelter’s overhanging roof, where there was only enough room to set up one of their tents. The group had a decision to make: all 8 of them were going to have to sleep in one, 4-person tent! Though it was crowded, when it was time to go to bed, they all squeezed tightly against each other, some of them lying partially atop others. Though most of them, except for Noah, didn’t get a good night’s sleep, they at least stayed warm due to their aggregate body heat. This may actually have turned out to be a good thing, as their sleeping bags weren’t rated below 20 degrees, and the overnight temp’s got down into the upper teens, with high winds buffeting their little tent. So, the next day, instead of getting away from the frigid winter of Minnesota, they woke up to a frozen, windy wilderness; just like back in college. The first thing they noticed was that all of their water was frozen and they had no way of filtering any from the spring. This gave them pause to consider giving up their plan of making it to Davenport Gap and instead they made the decision to make their way back toward the safety and comfort of civilization. Noah called Jeff at Laughing heart, who advised them to go back the way they’d come, but the group decided to move on anyway. They trudged on the next 7.5 miles and, by the time they all arrived at the naked, windswept bald of Max Patch, they were all worn out, wet, cold, and thirsty–maybe even a little dehydrated–and a couple of them were possibly in the early stages of hypothermia. In addition, some of the hikers shoes were not waterproof, so they had to hike for 2 days with cold, wet, feet. Noah said that they were all getting disheartened by the conditions up there. 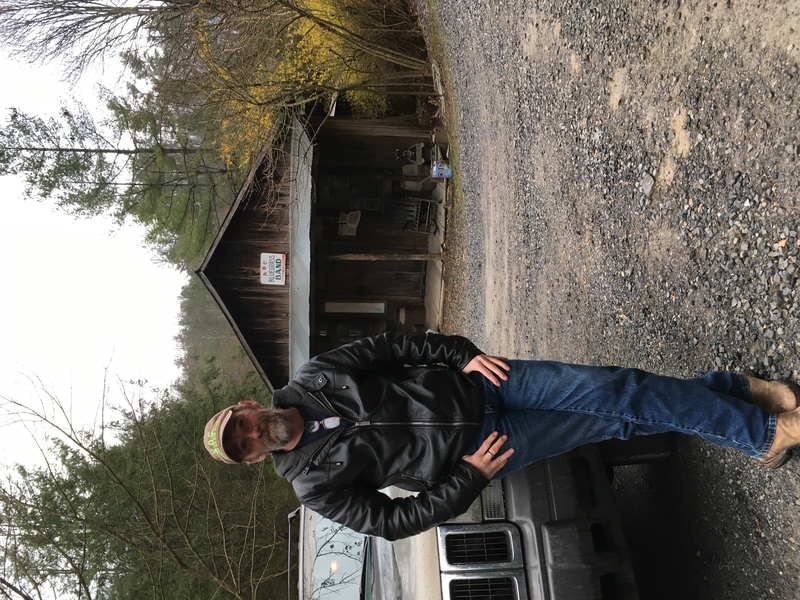 Jeff Hines, manager of Laughing Heart Hostel, told me that he received a call that morning from Noah, who was at Walnut Mountain shelter, asking for a shuttle to meet them later at Max Patch. 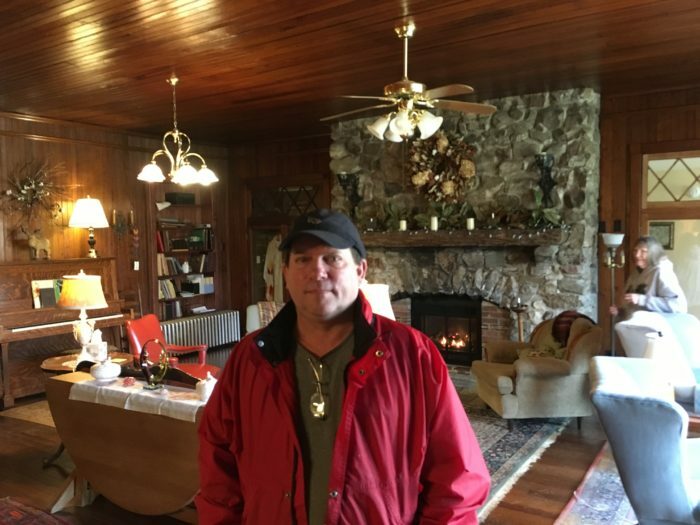 Jeff advised him against hiking the remaining 7.5 miles of rugged ups and downs, as the weather conditions on Max Patch were expected to get quite bad and the roads nearly impassable. He told them their best bet was to hike the 6.5 miles back down to Gorenflo gap, where they could easily be picked up. Too bad they didn’t heed his advice. The group decided to hike on to Max Patch anyway. 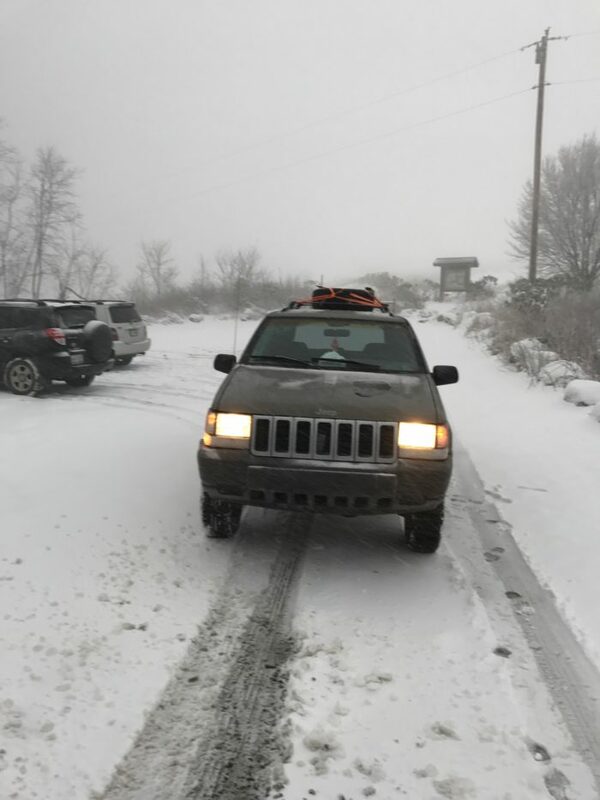 Once the group made it to Max Patch, one shuttle driver did manage to make the treacherous journey and was able to take 2 of the 8 hikers back down to safety, although she had a small wreck on the way back down the icy switchbacks leading out of the highlands. By late afternoon that same day, I happened to be sitting with Jeff at Laughing Heart, conducting a hostel interview, when he received a distressing call. It was from Noah. 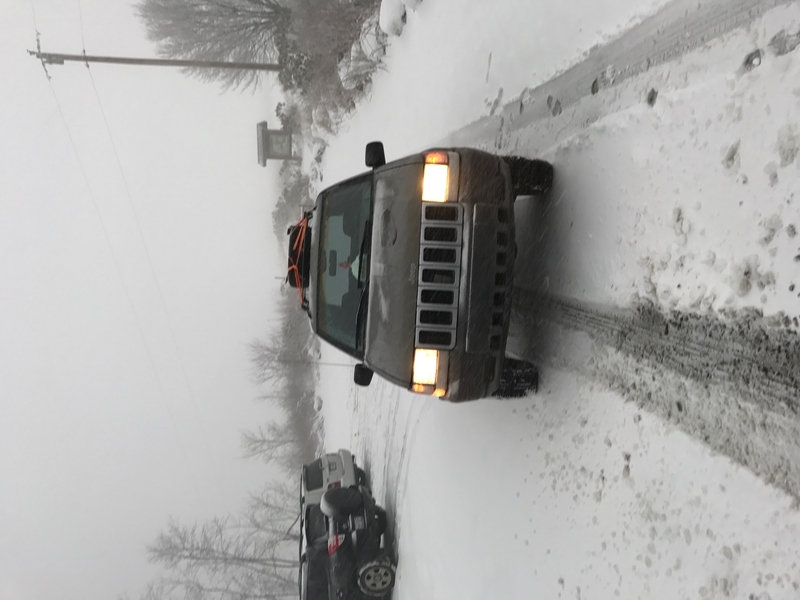 He was asking Jeff if there was anyone willing to drive up and get them, as some of them were beginning to show signs of hypothermia (blue lips and shivering). Jeff then turned to me, and with a pleading look, said, “Could you call your sister, Maria, at Standing Bear Hostel and see if she has someone who could pick them up”? Right away, I made the call to Maria, explaining the hiker situation and she told me, “I have K.O.G. here who has a 4 wheel drive Jeep. He said to tell the hikers he’s on his way”. After Jeff assured Noah that help was on the way, he hung up and turned to me and said, “Some nobo’s who are staying with me said that they had passed this group earlier in the week and that they were ill-equipped, some of them with no gloves and hats (which Noah disputes about the hats, but not the gloves)”, implying that they thought it was no wonder they were needing rescue. Jeff was clearly concerned about them. In 2016, K.O.G., age 43, who got his name from a former job, where he had to unlock and lock an entrance gate at the beginning and end of each shift, attempted a through hike, but when he arrived at Standing Bear on June 11th, he said he saw that Maria really needed help, so he stayed on. 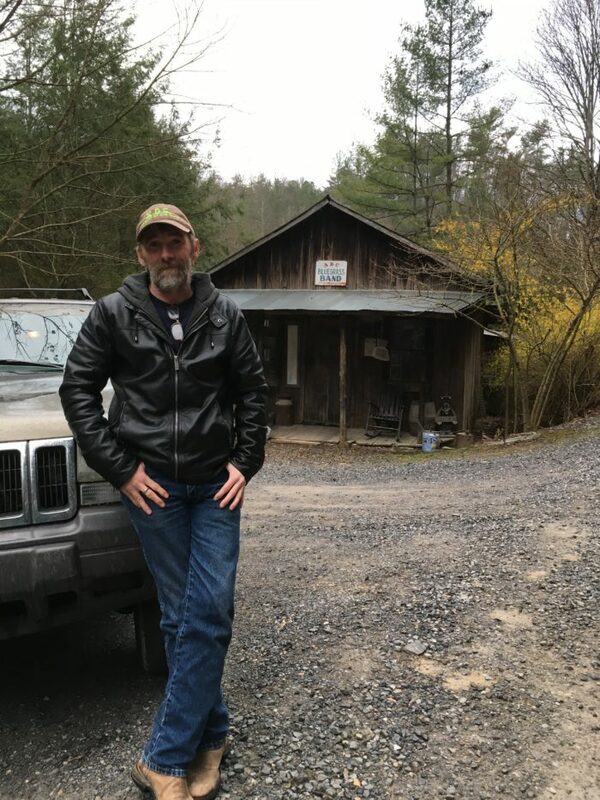 The moment he heard of the stranded hikers, he jumped right in his Jeep and raced up I-40 to Harmon Den Road and began making his way up the gravel road leading to Max Patch. 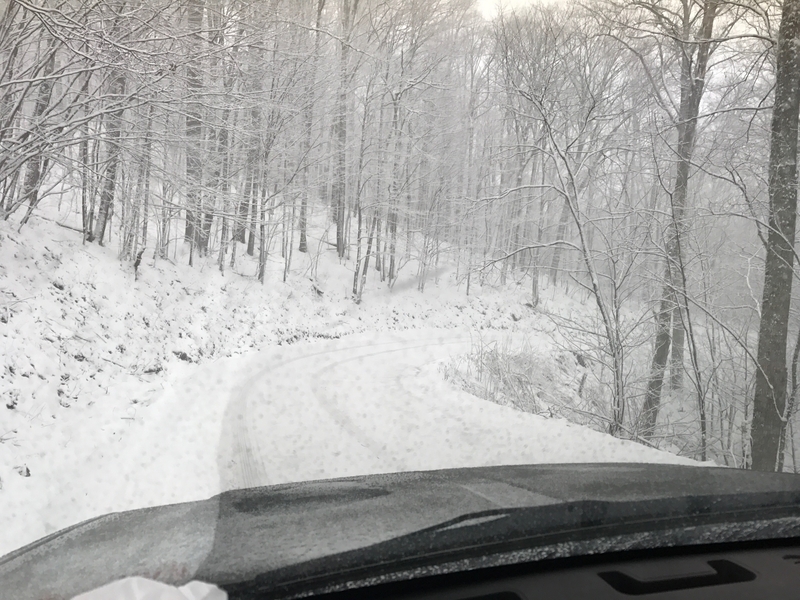 The steep, icy switchbacks leading up to Max Patch, with a ditch on one side, steep drop-off on the other, with no guard rails. On the steeper, more arduous switchbacks, he encountered several vehicles that had slid off the icy road and into ditches, but because of the ice, he was unable to stop and help for fear of getting stuck. Finally, he arrived at the Max patch parking lot and began to load the hiker’s gear onto his luggage rack, to make room inside for the 2 women and 4 guys. Once loaded, he steered his Jeep back down the way he came and on to the most frightening ride of his life. K.O.G.’s Jeep, ready to roll. He said he left the heater on full blast while waiting for the remaining hikers to walk down off the bald, so that any hypothermic hikers would get the life-saving heat they need. He said that the hikers were chattering cheerfully, thankful to be out of the cold wind but as soon as they reached the steepest, most icy switchbacks, K.O.G. told them, “Can you guys be quiet for a little while? It’s a pucker-up-buttercup situation here”. Sensing the danger, the hikers instantly fell silent while K.O.G., his hands forming a white-knuckled death grip on the steering wheel, carefully navigated the patches of ice, while gingerly applying his brakes to keep his 4 wheels from sliding. Once they made it back down out of the switchbacks, he said the hikers were thanking him, calling him names like ‘Hero’, ‘Savior’ and ‘Saint’, but K.O.G. said, “Why are you thanking me? This is what I love to do. I’m just a person, just like you”. When they got to Standing Bear, Noah told me that the hikers, “Cooked up a storm in the kitchen”, obviously grateful to be back in the comforts of civilization. Hearing this story, some may be tempted to judge these young hikers harshly, but no hikers are perfect and, no matter what their walk of life is, no matter what level their of intelligence or education is, all who hike can (and will) make mistakes in planning, preparation, execution, and judgement. However, unlike most people, who don’t often leave the comforts of modern society, you’ve got to give these young people credit for putting themselves out there, daring to do the things most only dream of. These students, albeit poorly prepared for such severe weather and rugged terrain, stuck it out during some really tough spots and hung in there. Did they make some bad choices? Hell yes, but they made choices nonetheless and, in the end, they worked as a team, doing what was necessary to survive. 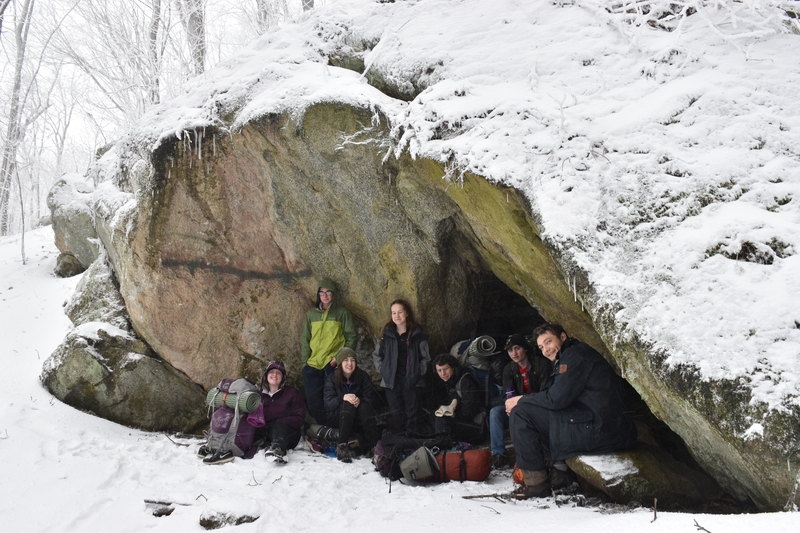 Now that they’re all safely back on campus, Noah believes the week’s adventure on the Appalachian Trail taught them all valuable lessons about themselves and about life. 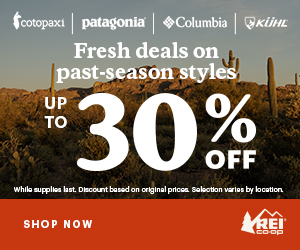 Now that the worst is past, they will undoubtedly find some retrospective happiness, when remembering all the beauty and grandeur of the wild Appalachians. Hostels continue being an integral part of the trail and provide more behind-the-scenes services to hikers than most people will ever know. In this event, it was heartwarming to see the concern that both hostel managers had for the welfare of the hikers and how they stopped everything and worked together to take care of hikers in distress. Although K.O.G. humbly and repeatedly insists he’s no hero, I think many would think otherwise–at the very least, 6 of them. But doing this of his own volition, risking his only mode of transportation, makes him a hero in my book. Maria too, is a hero. Day in, and day out, she keeps Standing Bear running, even after the passing of her dependable life partner, Curtis Owen, shouldering all the responsibilities of managing a busy hostel, while building onto her house, all the while raising two teenage daughters….alone. And a wonderful job she’s done…..
Here’s to the hikers, the hostels and the heroes! I have found in life that the true Heroes are the quietest and most humble people in the world!! Thank you all for helping these young people who probably will carry the lessons learned that weekend through out their lives and will possibly return the kindnesses to others many times over!! The community surrounding the trail, trail angels and hiker trash – young and old, is what makes the AT such a treasure. Thanks to anyone who has ever reached out or gone beyond the call of duty to aid hikers in a moment of need, especially those who put their own safety at risk. “We take care of our own” really does apply to all of us who share the love in this community. I stayed at Standing Bear a number of years ago [when Curtis was alive] and cannot say enough good things about them and the hostel. Noah put his hikers and rescuers at risk of their lives. Leaders need to take responsibility for equipping their group, assessing conditions and being conservative when others are depending on them to make the correct decisions. One has to wonder about his training and qualifications. Not only did he (according to this story) ignore the weather reports, his group was not equipped for conditions (leaky tents, incomplete clothing, inadequate footwear). He also ignored the experienced opinion of local experts, when they told him to head back, rather than pressing on to Max Patch in deteriorating conditions. You talk about student s”sticking it out” in the tough spots and “hanging in there”. They didn’t really have a choice, due to Noah’s poor leadership. This would not be such a light hearted story had K.O.G. be a bit less lucky (or skillful) in getting up and down the mountain. Everyone was lucky and came back with a great story–this time.